In the end, this result came down to a simple philosophy enacted in bright sunshine and light winds at the McAlister Oval. The Irish Warriors simply did everything better on the day. The basic three skills – kicking, marking and handballing – were just executed better all day by the Warriors and that was enough for them to grind out a tough win against a very willing opponent. 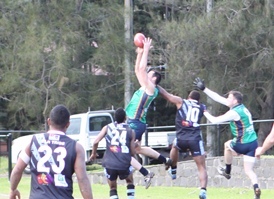 Initially the game featured the higher skill level of the Irish up against the speed of the Fijians. But the tempo changed when a nasty incident saw one Irish player poleaxed in a crude tackle, leading to a red card send off for the Fijian player. From then the 17 man Tribe squad faced an uphill battle. The Irish players managed to then find space and were cleaner with the ball. They were also winning in the ruck with Padraigh Lucey and Paul O’Halloran just too tall for their opponents and giving Ireland first use of the ball again and again. The second quarter saw the solid Irish defence holding firm as the Fijians fought back into the game. In a scrappy affair, the rebounding Fijian defenders Dylan Wolfgramm and Maciu Raida set up more run and the Fiji team got back to within a goal. However, they were having trouble containing Irish forward Mick Finn and the Irish banged home a couple of goals to go to the half time break well clear. The Warriors dominated early possession in the third quarter, and maintained tremendous forward pressure. 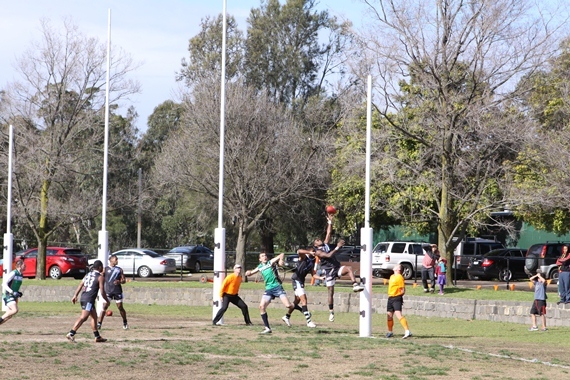 The Tribe defence still held up admirably, but the dam wall was showing cracks and the Irish steadied to extend their lead by three quarter time. Fiji managed the first three inside 50’s of the final quarter and there was just a small hint of a Fiji comeback. But a fast break from defence by Ireland saw the ball finally wrenched out of the Fijian attacking zone and the tempo changed. Whilst the Irish did not score from the move, it changed the momentum and from there the Irish cruised comfortably to the line, winning in the end by 52 points.